Hamlet Au provoked his readers to crowdsource the meaning of Oz Linden's post on Third-Party Viewers. I am paid, in part, to teach students the art of literary exegesis. I have a spare 30 minutes on my hands...so here we go! If you find this soporific, then it may help because we all need a good nap from time to time. Oz begins with a moment of uncertainty, purportedly with his recording equipment: This resembles the existential ambiguity faced by Vladimir and Estragon, at the start of Beckett's Waiting for Godot. At the same time, this builds a dramatic tension essential to any literary work. Thus, even thirty seconds into the recording, we have an existentialist text, though we lack Camus' dead Arab on a beach or Bowles' tongueless madmen, wandering the Sahara. "Four new clauses" added to the policy: this is classic theater. We have a play in four acts, but it remains to be seen if the drama will be tragic or comic in nature. Farce may be likely, given the history of earlier texts from Linden Lab. That Linden Lab no longer distributes the Snowglobe viewer: clearly a reference to Welles' Citizen Kane. 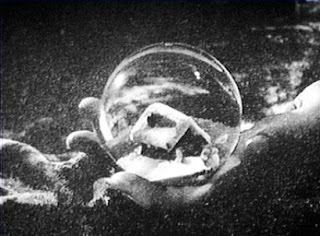 In this landmark film, at a crucial moment, namely, his death, Charles Foster Kane drops a snow globe, redolent with memories of his childhood home that he lost, along with his innocence. He then went on to become a titan of his era's information industry. Could the loss of this Snowglobe be a parallel moment for the utopian and youthful Lab, as new products take it into fame? Or portend a titanic fall? LSL will only return true presence data: This marks a curious turn to New Critical hermeneutics, as popularized by the Well-Wrought-Urn school of scholars such as the Nashville Fugitives. One must not seek outside the object of art to find meaning. One must only consider the art itself. While such a stance is consonant with Second Life as a walled garden, this reference could, ironically, foreground the inherent contradictions of Oz's message. Postmodern hermeneutics teaches us, however, that all works self-destruct. In Oz's case, ambiguity has mingled with "true presence." This, as I am about to show, descends into the realm of horror. "It is a different bug" and "if it is not fixed, we will deal with it as a bug": We are back to Existentialism again, but with a surreal turn as we venture into Kafka's "The Metamorphosis." But who is to be the hapless Gregor Samsa? Perhaps SL educators, since we have been neglected or squashed, like bugs. "The User can say anything they want...the viewer cannot do it for them." This is classic Reader-Response Theory at work. Oz notes that the user, like the reader, can make interpretations and statements not contingent of the text, or in this case, the viewer. Each reader must struggle on his or her lonely road to finding meaning, if any can be found, in the text. Thus, and in conclusion, Oz's text contains no hidden message identical for each of us. At this point, I began to drool and fell heavily on my keyboard. Excellent analysis! "Postmodern hermeneutics teaches us, however, that all works self-destruct. In Oz's case, ambiguity has mingled with "true presence." This, as I am about to show, descends into the realm of horror." Fantastic! Unfortunate that you fell asleep prior to integrating the "shared experience" of the fourth act into your cogent exegesis. Surely the desire to maintain a shared experience is a reference to Ibsen's "A Doll House". I'm just not sure what the slamming of the door translates into in LL policy terms. Hope you had a nice nap! Oh well done, sir. Well Done. One must storm the barricades of Art, ladies, Post-Structuralist torch and pitchfork in hand. Missy, the Ibsen reference is well taken. I have only seen the play performed in Polish, in 2006 in the National Theater in Warsaw. As I do not speak any Polish beyond "thank you," "good day," and "Kielbasa" I was able to take in the drama in a Jungian manner...I went straight for the archetypes. Jungian analysis is a bit antique in English Departments, but I'll just have to dust off my Jung to show the parallel. We are, in our migrations from Linden Lab, replicating the same ancient impulses of fleeing a stultifying but secure home for a life of freedom. I would, moreover, suggest that we are Nora, leaving Torvald. In my exegesis, Torvald represents the comfort and security of Linden Lab...and we set forth for the freedom and responsibility of OpenSim. Cecil, you can even get yourself some "Flute Girls" in SL...why it IS ancient Greece.